Do you remember the movie Space Odyssey? 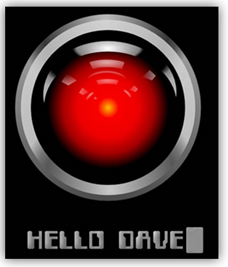 A true Masterpiece … At the center of Arthur C. Clarke’s movie is a computer called HAL. A computer with artificial intelligence who can understand, think, speak and express emotions. Since the movie came out in 1968, we witnessed many examples where computers perform tasks that require a high degree of intelligence. Computers fly planes; make decisions about stock market investments, recognize faces inside photos, and more. In 1997, IBM’s Deep Blue defeated chess game world champion Gary Kasparov. But since then, a real computer didn’t have even slightly similar capabilities similar to HAL. Yesterday was the first battle between Watson, the new supercomputer from IBM at Jeopardy, the popular trivia game show in the U.S.. The questions asked in this game are very difficult and complex. The winners of this competition are intelligent people with wide knowledge and analysis capabilities. So what happened yesterday? Watson defeated the contestants. Watson is actually a Super Computer which runs on 90 servers working in parallel. He doesn’t express feelings and has a long way to go. But it represents the first time in history where people can talk to the computer, ask questions and get answers to complex smart and precise. From this perspective, Watson and the participation in Jeopardy is an historic event. Event which illustrates what future researchers say many years. Humanity is approaching rapidly towards the era in which computers will be intelligent. As such, they will improve our own intelligence. In addition to Augmented Reality, will witness to Augmented Intelligence. Computers which will enhance our ability to think, understand and make decisions. This entry was posted on Sunday, March 6th, 2011 at 8:19 pm	and is filed under Marketing. You can follow any responses to this entry through the RSS 2.0 feed. You can leave a response, or trackback from your own site.